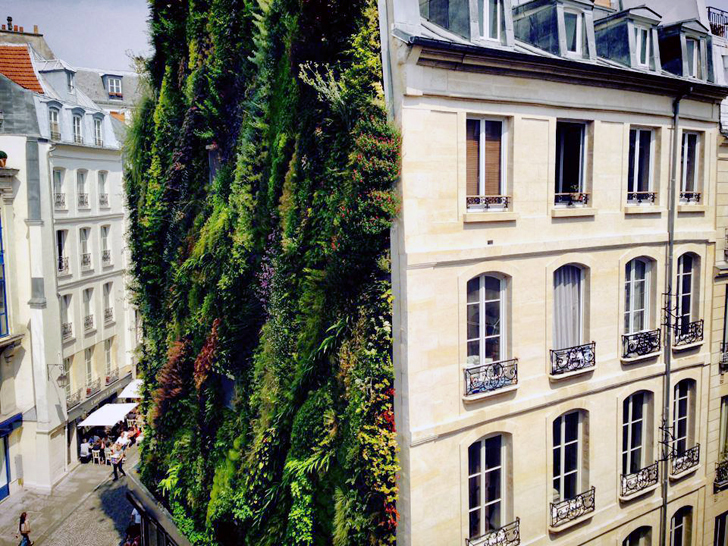 Vertical garden expert <a href="http://www.verticalgardenpatrickblanc.com/node/4676" target="_blank">Patrick Blanc</a> just enlivened yet another Parisian townhouse with thriving foliage. 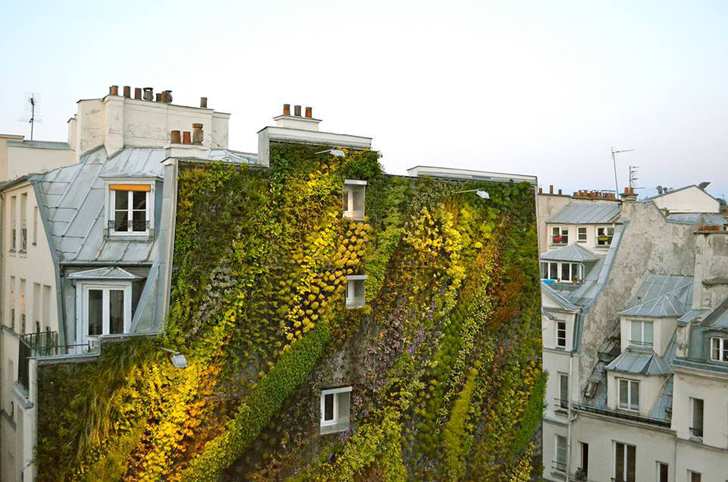 Aptly named the <a href="https://www.facebook.com/pages/LOasis-dAboukir/451386008272672" target="_blank">Oasis of Aboukir</a>, the soaring living wall was created to kick off Paris Design Week, which runs from September 9-15. 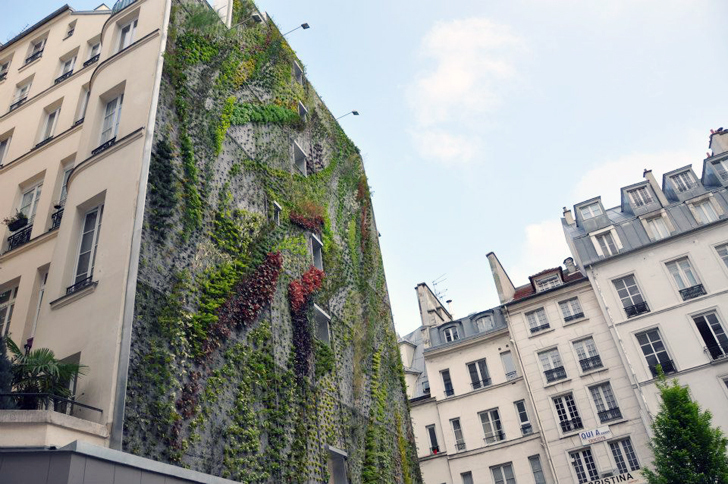 The <a href="https://inhabitat.com/vertical-gardens-by-patrick-blanc/" target="_blank">beautiful vertical garden</a> was installed and grown in just seven weeks, adding an <a href="https://inhabitat.com/pics-patrick-blanc’s-dazzling-vertical-garden-wonderland-is-laced-with-7000-orchids/" target="_blank">infusion of greenery</a> to the historic neighborhood. 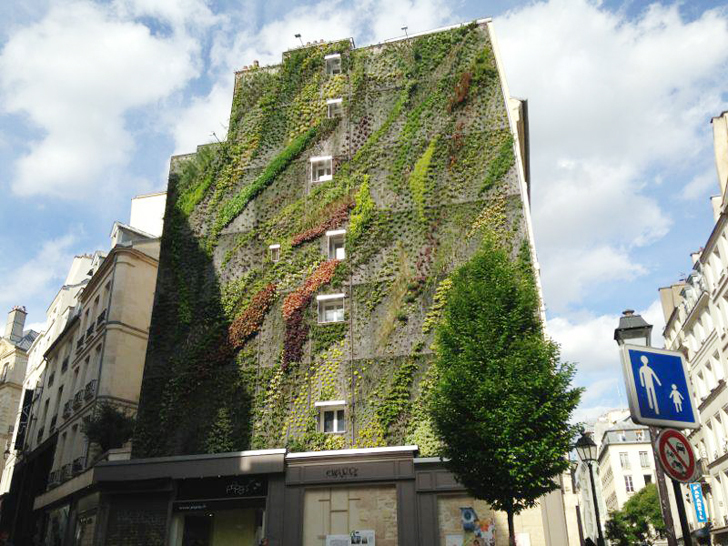 Blanc’s team began installing the framework for the <a href="https://inhabitat.com/patrick-blancs-lush-vertical-garden-is-a-green-oasis-in-the-middle-of-madrid/" target="_blank">gorgeous vertical garden</a> just seven weeks ago on the corner of Aboukir Street and the Petits Carreaux street. 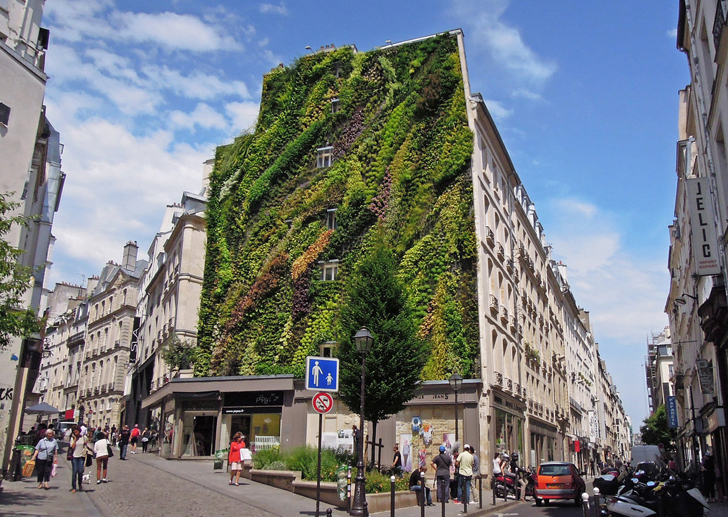 Starting one story above street level, the <a href="https://inhabitat.com/londons-largest-living-wall-sprouts-up-on-a-hotel-in-victoria/" target="_blank">vertical garden's</a> pattern reaches diagonally - as if toward the sun. 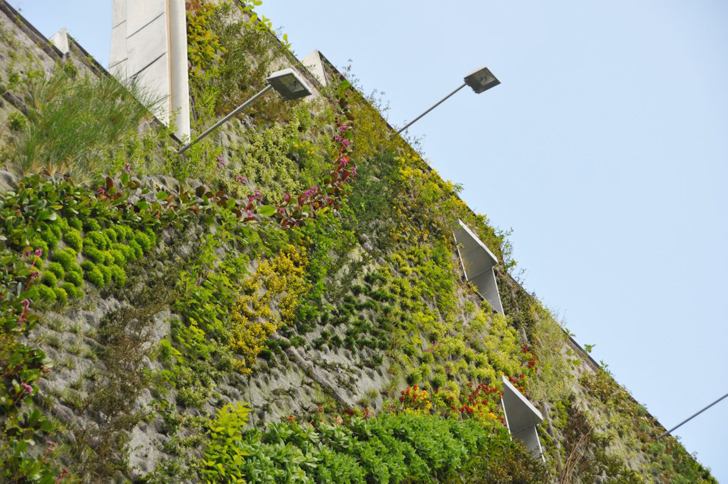 Over the past seven weeks, locals and passersby have been able to watch the garden as it slowly turns the concrete façade into a lively blend of colors. Before the garden was installed, the side of the building was an eyesore, with uneven paint and random graffiti scrawled across the surface. 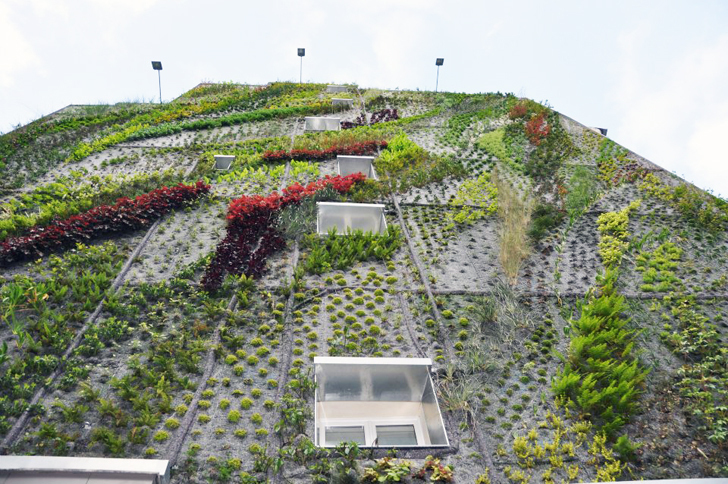 The <a href="https://inhabitat.com/sheraton-vertical-garden-built-for-mile-high-gardening-conference-in-denver/" target="_blank">vertical garden</a> not only transformed the side of the building, but also reactivated the small pedestrian triangle below it, where the Aboukir and Petits Carreaux intersect.